Fat-Face-Frankie Spolansky was, as his nickname implied, a food-oriented child. I suppose he had little choice in the matter: his parents owned a deli. But just because he would one day inherit the Spolansky corned beef fortune and a dozen or so barrels of kosher sour pickles, didn’t give him the right to tease us. After their thrilling yet perilous trip to the 23rd century in Whispering Leaves, Oliver, Rosa and Iris, members of the bookshop’s reading club, land safe and sound back home exactly where their story began – or maybe not? Everything seems like it always was, yet ... somehow it’s different. 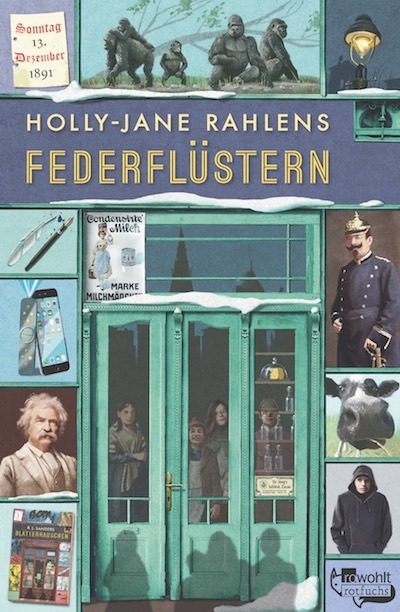 But before the children even have the chance to figure out what’s wrong, in Holly-Jane Rahlens’ new science fiction novel, Silence of Snow, they’re whisked away again – this time into the distant past. Trapped in a dangerous time warp with Lucia, a mysterious new-girl-on-the-block, our protagonists time travel back 125 years to the snowy and blustery winter of 1891. As fate has it, it’s the same winter that America’s most famous and revered author, the brilliant Mark Twain, is living in Berlin’s imperial city. Maybe he can help the children get back home. After all, he wrote one of the first time travel novels ever. But then the unforeseen occurs and the children’s passage home is blocked. Will they have to remain in the 19th century forever? It was the fall of 2015. I was sitting in front of my Mac with an empty Word doc staring back at me. A first sentence slowly appeared on the screen – “Oliver-made-his-way-down-the-stairs-lugging-a-heavy-trash-bag-and-some-empty-bottles.” It was a first sentence, yes, but I was still unsure as to whether I’d ever be able to sort out all the chaos in my brain in respect to this new book — certainly not as tidily as Oliver dunking empty bottles into their respective bins in the backyard. Luckily, the book did sort itself out. How did I do it? I haven’t a clue. Once again, the birth of a book was a mystery to me and one that that will likely remain so. As my protagonist Oliver, 13 years old, says in Silence of Snow, “It’s a leap of faith. You have to trust that it will happen.” I think he’s right. I trusted that it would happen. I don’t care all that much how. It might ruin the magic. What I do know is that the time comes when the chaos sorts itself out and the book begins to take form, begins to reveal itself, its story, its characters, its underlying themes; the time comes when I can’t sleep a wink until I finally solve that plot problem that has been nagging at me for days and robbing me of my shut-eye; the time comes when piece by piece the puzzle that is my book begins to fall into place, all the open questions are answered, the loose ends come together, the bad guys are done in and the good guys make it back home, tired, hungry, with a bad cold and a few broken ribs, but somehow wiser. And I, finally, get to sleep through the night. But, alas, that’s when the hard work begins. I need to cut the cord. This is the thing: during my journey I’ve fallen for one or another of my characters. It’s bound to happen. And now the time has come to say goodbye. I have to. For how can I start work on a new book with a new hero or heroine if I’m still clinging to my last love? It’s always been like that. I love them. And then I leave them. And I’m pretty sure that’s the way it has to be. I see it like this: if I fall in love with a character, the chances are good that my readers will too. What more could a writer want? The first time it happened was in 2001 while writing Prince William, Maximilian Minsky and Me. I fell for Max. What a guy. A rebel. Funny. Smart. And so cute, even if he did make himself up to look like a vampire. Sadly, my heroine, Nelly Sue Edelmeister, 13, was not impressed. She already had her hopes set on 15-year-old Prince William (the book takes place in 1997, just after Princess Diana’s tragic accident). I sweated blood trying to convince Nelly that Max was the better choice. In order to convince her, I fell in love with Max myself, leaving her defenseless, of course, to his charms, which ultimately paved the way for their friendship. It was a “leap of faith” for all three of us — and it worked! Not long after, I fell for Mick Maier. He’s the male star of my novella Wallflower which was published in 2009, but takes place in November 1989, two weeks after the fall of the Berlin Wall. What a charmer Mick was — even he was 6’4” and way too tall for me, a mere 5’4” on a good day. He had a very strong Berlin accent, too, which kind of got on my nerves. Plus, he was always in a good mood. Always! It was quite irritating. On top of that, he was from East Germany and I was a gal from the West. But he and Molly Lenzfeld of New York, New York, were a match, I felt. She was a little self-conscious and a bit blue and had built a wall around herself, which was a pity as she was great in chemistry, was a top-notch baker able to whip up a mean Key Lime Pie at a moment’s notice, and best of all: she was almost as tall as Mick, measuring in at 6’1” and sporting size 45 shoes. So I fell in love with Mick and then – wham boom! – three hours after meeting Mick, love finally came to Molly (and to my readers, too, I hope). Actually, it hits her over the head like a brick. ... because then I was available to fall in love with none other than Mark Twain! Yep. Samuel Langhorne Clemens himself. He plays an important role in my time travel novel Silence of Snow. You could say he’s the mentor figure for my gang of three – Oliver, Rosa and Iris – who by accident fall through time and land in Berlin in a wintery-cold December of the year 1891. During the winter of 1891/1892, exactly 125 years ago, it is a true fact that Mr. Clemens lived with his wife Olivia and their three daughters in Berlin for six months, first in Schöneberg on Körnerstraße and then in Mitte in the Hotel Royal. I didn’t mind at all that Twain was married. I conveniently got rid of the female clan members by sending them off to Leipzig to do some Christmas shopping and to take in a concert of the St. Thomas Boys’ Choir. This allowed me to spend three whole days with Twain alone in his apartment. I can say with great confidence: it was a wonderful, exciting and once-in-a-lifetime experience. It’s not every day that you meet such a witty, wise and charming author. I was in awe, as my young protagonists were too. In his day, Twain was an absolute phenomenon. 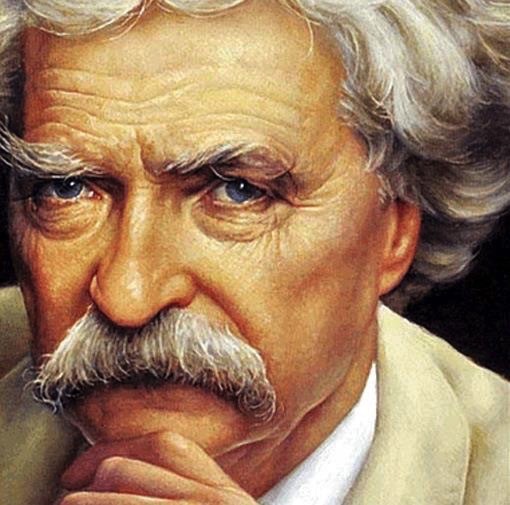 He was not only the creator of America’s greatest and most beloved children’s book characters, Tom Sawyer and Huckleberry Finn, but he was also a Mississippi River steamship pilot, an inventor, a travel journalist, a writer of science fiction, and an authority for German (“The Awful German Language”). He was also an entertainer and is arguably America’s first superstar (“The doors open at 7, the trouble begins at 8,” he liked to say of his lectures, readings and performances). What a character! I actually believe that were Silence of Snow real life, Mark Twain would likely have reacted to the sheer absurd situation I put him into, more or less the way I wrote it. And because of that, I love him dearly. And I hope my readers do too.